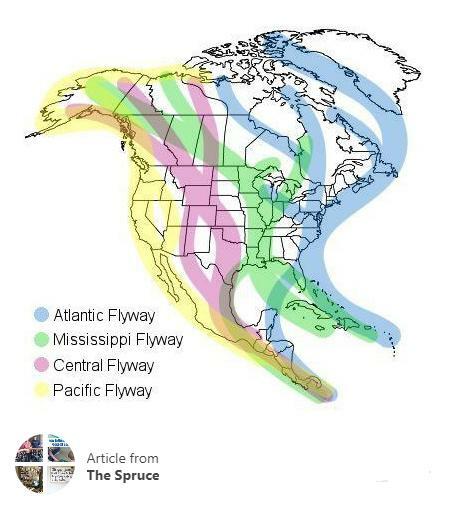 Earlier this week Libby Strizzi sent me an email with this ruby-throated hummingbird migration map and the question: Why are the hummingbirds everywhere but here? I’ll bet this is because northwestern PA is not on any spring migration flyways. Migrating birds use four aerial “highways” to reach their breeding grounds in the spring. Pennsylvania is fed by the Atlantic Flyway. You can see this on the map below by Melissa Mayntz from her article 12 Types of Bird Migration at The Spruce. Notice the “hole” in northwestern Pennsylvania where the migration highway splits into two streams. Early migrants are probably following the main highway and not stopping in PA’s northwest corner. Other migrants fill in the gap but they arrive later. And notice that two flyways meet in northwestern Ohio at Lake Erie. Two sources of birds! That’s why birders flock to Magee Marsh, Ohio in May. We’ll just have to be patient. They’ll get here when they get here. I’ve been following the northward migration on hummingbirds.net for years and it was crazy to see sitings so early this year…..so I put out my feeder about a month early. I haven’t seen a hummer and the feeder levels haven’t moved. I know it will happen soon and I can’t wait. There have been discussions on the internet regarding the early postings on hummingbirds.net I believe it’s just one of those years….everything is so early.